Jay Berwanger, football star at the University and first winner of the Heisman Trophy, died Wednesday, June 26, of lung cancer. He was 88 years old. To football aficionados, Berwanger is well known as the winner of the first Heisman Trophy and the first player chosen during the National Football Leagues first draft. Less well-known is that he achieved his athletic successes at Chicago, a school now more closely associated with Nobel prizes than big-time football. Berwanger, a halfback, played for the Maroons from 1932-1936, when Chicago was a member of the Big Ten Conference. Even in an era before football teams were divided up into offensive and defensive squads, Berwanger was renowned for his versatility. He called plays, ran, passed, punted, blocked, tackled, kicked off, kicked extra points, and returned punts and kickoffs. Berwangers list of nicknames was just as long: Genius of the Gridiron, the One-man Team, the Flying Dutchman (though his ancestry was actually German) and the Man in the Iron Mask (because he wore a special face guard to protect his twice-broken nose). In 1935, the Chicago Tribune awarded Berwanger the Silver Football for Most Valuable Player in the Big Ten. His coach, Clark Shaughnessy, called him every football coachs dream player. You can say anything superlative about him, and Ill double it. Of the 107 opposing team players he faced during his senior year, 104 said the six-foot, 195-pound Berwanger was the best halfback they had ever seen. In November of 1935, Berwanger received a telegram from Manhattans Downtown Athletic Club, informing him that he had won a trophy for being the most valuable football player east of the Mississippi, as well as a trip for two to New York. It wasnt really a big deal when I got it, Berwanger recalled in 1985. No one at school said anything to me about winning it other than a few congratulations. I was more excited about the trip than the trophy because it was my first flight. The prize was renamed the John W. Heisman Memorial Trophy, after the clubs athletic director, the following year. 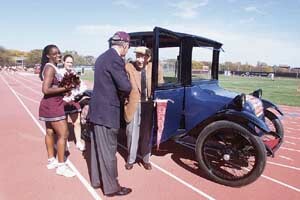 At his last Homecoming appearance on Saturday, Oct. 20, 2001, Jay Berwanger was greeted by President Randel after taking a victory lap around Stagg Field in the 1922 Milburn Light Electric car once owned by legendary football coach Amos Alonzo Stagg, who was the Universitys athletic director from 1892 to 1932. He was born John Jay Berwanger in 1914 in Dubuque, Iowa. In high school, he excelled at wrestling and track as well as football, winning renown as an all-state halfback. After graduation, Iowa, Michigan, Minnesota and Purdue all tried to recruit him, but he opted for Chicago, which had offered only a basic tuition scholarship of $300 a year. The legendary Amos Alonzo Stagg, who helped define the game of football as we know it today, coached Berwanger for just one yearBerwangers first year at Chicago was Staggs last. As well as captain of the football team, Berwanger was captain of the track team, senior class president and head of his fraternity, Psi Upsilon. Berwanger also was the first player chosen for the National Football League during its first-ever draft, in 1936. After the Philadelphia Eagles signed him, Coach George Halas of the Chicago Bears acquired the signing rights. But when Berwanger asked for $25,000 over two years, Halas decided that was too much money, so Berwanger took a job as a foam-rubber salesman. During World War II, he enrolled in the Navys flight-training program and became a naval officer. After the war, Berwanger set up Jay Berwanger Inc., a manufacturer of plastic and sponge-rubber strips for car doors, trunks and farm machinery, in Downers Grove, Ill.
Berwanger was never sure what to do with his Heisman Trophy, which was too wide for a mantelpiece and too large for a coffee table. For years, his aunt Gussie used it as a doorstop. Berwanger eventually gave the trophy to the University. Once on display in Bartlett Gymnasium, the trophy is in storage until a new athletic center is completed. Berwanger, a member of the Alumni Association Board, received an Alumni Service Medal in 1984. He served as a member of the College Visiting Committee, chair of the Presidents Fund in 1993, and chair of his 55th and 60th alumni reunion committees. Jay Berwangers extraordinary athletic prowess was left on the playing fields of the University more than half a century ago, said President Randel. But in the 60-plus years since then, he has meant much more than athletic achievement to thousands of students and fellow alumni. He was an old-fashioned gentleman, whose modesty was never corrupted by his fame. He was extraordinarily generous toward generations of students. Berwanger married Philomela Baker, also a Chicago graduate, in 1940; the Berwangers had two sons and a daughter. After her death in 1975, he married Jane Temple, who died in 1998. Berwanger is survived by three children: John Jay, a retired lawyer who graduated from the University Law School in 1967; Cuyler, a high school guidance counselor; and Helen Berwanger Tierney, a restaurant owner in Onaway, Mich. He also is survived by three stepchildren: Barbara Fewkes, Joseph Marsh Temple, Mari Anne Gerwing, as well as 20 grandchildren and 13 great-grandchildren.